This entry was posted in Uncategorized and tagged Lab notebook, lab report, labs. Bookmark the permalink. I like the idea of rotating the notebook’s that are being assessed. I have had a hard time implementing these with my MS sts. I think I was on a good path my HS sts, but then I went to MS and I haven’t found the right key for the sts. to truly own them. I also have gotten overwhelmed with the “grading” of them and also dislike the copy, rinse, repeat effect. I will definitely need to mull this post over as I look forward to next year. In terms of lab work, I often have them do observations and data collection together, but then I have them do the analysis and conclusions themselves. For my 8th graders during chemistry, I had been using the skills lists with ACS’s Inquiry in Action as a better means of assessing their lab process. Not perfect, but I think it’s a foundation to work from. Observation still plays a large role because not all students engage in the work to the same extent as other students. I am looking to do more student blogging/e-portfolios with students, so I am thinking that conclusions to lab reports would be a good item to have students write on their blog. So are your lab groups static all term long? I like to shuffle groups around, particularly as I figure out who works well with whom. But I suppose one week could be A1B1C1 A2B2C2 and the next week could be A1B2C2 A2B1C1 etc, with just a student’s assignment to a letter remaining fixed. Maybe. For my middle school students, I provide a single packet per group with a template for the lab investigation that is essentially just space to write in each section. Students divide up the roles in their lab groups and work towards collectively complete the lab. When the lab is complete, I ask for the students to use the Science Olympiad experimental design rubric to evaluate whether their lab is complete, then I collect it. I mark the lab with some feedback, but do not assign a grade. Instead I return a copy of the group’s work to each student and they decide what to do with the feedback. In the future, I want to have a better system in place for ensuring that each student takes on different roles from one lab to another, but that seems like an easy fix by just assigning students to different sections each time. In the end, I think this encourages students to work together (limited time and small groups also help) while also getting a fairly accurate final assessment of each students’ understanding of the lab. I think that is a very smart move to reduce the grading. This year I had the students hand in only 2 lab reports. The first one got feedback from me, the second one was graded. I think it depends on your students, but for mine I get a lot of reports that are basically the same. Only the conclusions are different. From this, their grade typically is determined from the conclusion, as the data, observations, etc are all ok. I also did sort of a summative inquiry assessment, through a lab practicum. 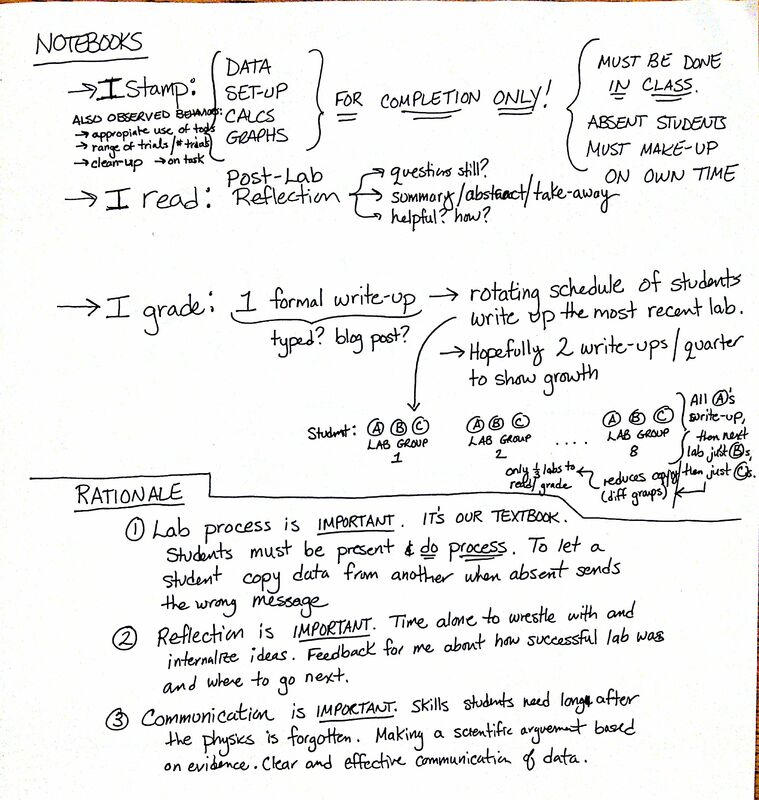 My soft plan for next year was to move to using lab notebooks, not unlike what you’re doing. I was thinking of treating the lab notebook more like a portfolio, where at the end of the year each student picks out maybe three labs to show progression, learning and competency. I like the rotating piece. My colleague and I were brainstorming how to improve the quality of reports next year, and someone posted an article about writing scientific papers rather than reports. I think we are going to have them do analysis and conclusions on a 3-4 labs with a common theme throughout a semester and give feedback, then they will write a scientific paper bringing it all together. We are thinking of making the theme for semester one be the effect of mass on acceleration; they can do it on ramps during kinematics, then with friction in dynamics, then with projectiles. Haven’t found a good theme for sem two though. Whatdya think? I agree. I am currently grading LeChatelier lab reports for communication purposes. Most students determined the direction of shift, but their explanations lack completeness. I think it is important to collect immediate reflection (makes students analyze what they have done) and then selected parts of the disc and/or conclusion. So again, I agree! I also have students work together for the first part of the lab (determining their question, planning out materials/procedures, and data collection). Earlier in the year, I also had students collaborate on their claim, evidence, and reasoning, which are the parts I try to emphasize the most. Eventually, the latter parts become more independent. I still let them work together setting up the lab and collecting the data, just to make sure everyone in their group is on the same page. I’m a year away from having every student with an iPad and am trying to think how I can utilize the iPad to make lab reports better. So far, I am thinking about having students use the Numbers app to organize their table and collect data; use the Pages app for the lab report itself; then use the camera function to take photos of observations and experimental setup, which can be inserted into the Pages document. I have been teaching chemistry for quite a while now, and this year used a this website: http://www.ncsu.edu/labwrite/, and walked my students through writing up a lab report with it. I was quite impressed with the quality of their reports. I wouldn’t do this with every lab- just the formal ones, but you may want to look at it. I am wondering what you think of your new system after a year of doing it- did it work the way you expected? Are you tweaking it? I’m on a mini-rampage about my lab notebooks. In my case I would have to lug around 120 composition books. In many cases the students didn’t keep them organized (I have middlers) even though they were required to, so the labs were hard to find in the notebook or even just missing. I’ve done lab notebooks for two years, and decided to nix them this year. Since I teach middle school, my focus is a little different than yours. I want to teach them experimental design and analyses (using the CLaim-EVidence-Reasoning [CL-EV-R] format). I used to have them write out all their procedures and variables for every lab even when I gave it to them. Now this next year, I think I’m just going to have them keep a lab section in their binder. We already do an organized binder system, so this will reduce the amount of systems they have to keep track of. When I need to grade something I will just collect that specific paper (i.e. a lab analysis, or an experimental design sheet). This will be at least 1/100th the weight of what I carry around now. Then I can just collect what I care about and not the extra stuff. Also students can still do labs while I’m grading, where as with lab notebooks they couldn’t (because I’d have their lab notebooks).